Preheat the grill over its medium setting. Lay out an approximately 2-foot long sheet of aluminum foil. Pile the summer squash in the center and top with half the thyme. 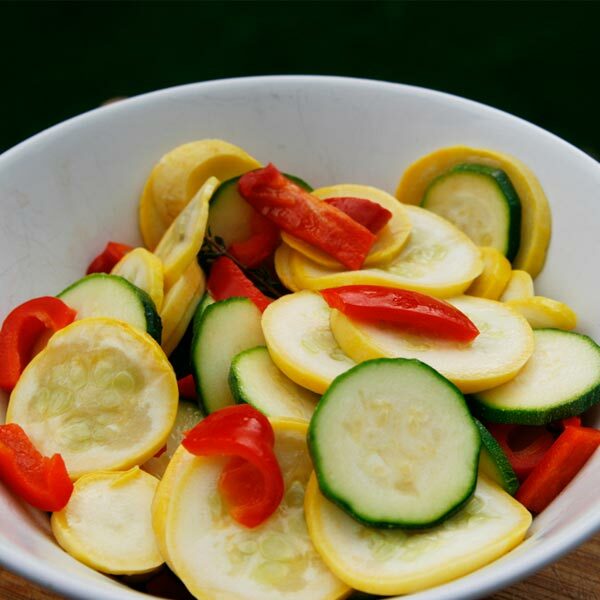 Pile the zucchini on top, followed by the remaining thyme and red bell pepper. Place the crushed garlic on top. Cut the butter into 8 pieces and place around the veggie pile. Fold up the sides of the foil and seal together all around. Place on the grill and cook for 15-20 minutes, to crisp tender. Carefully cut open the packet, allowing steam to escape. Season with salt and pepper. Transfer to a serving bowl and toss together. Serve.